WOW! What a GREAT game! It was fantastic to meet so many of you last month in Houston at Super Bowl XXXVIII. Thank you for stopping in to shoot the breeze. Now it's time re-check your gear needs so that you can get ready for that 1st pitch, "Opening Day" is just weeks away! With Canon's EOS1D-Mark II just over the horizon, the phone hasn't stopped ringing, the e-mails are piling up, and the instant messages are flashing all day long. Hopefully Canon will begin delivery sooner than later, and we can make sure you get your new camera for the start of Baseball season ...If you haven't already placed your "pre-order" for the Mark II, there's still plenty of time ...Two of the new PowerShot cameras from Canon will catch your eye, the PowerShot Pro1 has 8 Megapixels, a 7X Optical Zoom which is a 28-200 (35mm equivalent) and is also an "L" lens. 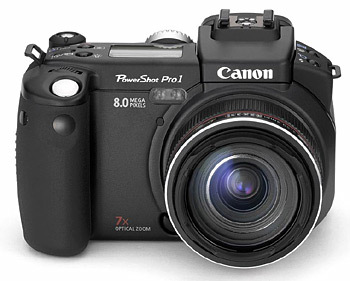 With 12 "EOS" shooting modes, the professional photographer will be totally at ease with the Pro1. The PowerShot S1 IS is a 3.2 Megapixel camera with a 10X Optical zoom, that incorporates Canon's IS, Optical Image Stabilizer system! The new Nikon CoolWalker Digital Storage Photo Viewer is also very exciting! Store up to 10,000 digital photos on the high-quality 30GB hard disk. Let's you store and immediately view your photos on the high-quality 2.5 inch TFT color monitor. Transfer photos direct from Coolwalkers to CF card or to a computer via USB 2.0. A slideshow feature and remote control add up to fun for the whole family when COOLWALKER is connected to you TV. PictBridge compatible - outputs directly to a printer. Beginning March 1st and through June 30th 2004, Nikon has a new Cash Back Rebate program in effect. The $$ have been increased!! Thinking about a 300 f2.8 ED-AFS-II ?? Now, you'll get up to $800 back on it! Call me for details. The Nikon $500 D1X Rebate will stay in effect too through April 30th. Delkin's CardBus 32 Adapter has been reduced in price ... NEW Sports Shooter member pricing $44...Contact me for this pricing. We have also received the new compact Delkin Pro FireWire Reader/Writer ... SportsShooter.com member priced at $44. It seems that Kodak is offering VERY short 3-4 day promotions on the 8500 Printer, ML500 Printer and some cameras at weekend events. If you are thinking about purchasing a Kodak product within the next 90 days, please let us know and we'll notify you of any upcoming promotions, so that you save some $$. Monaco is offering up to $75 cash back on their MonacoOPTIX, MonacoOPTIX Pro and the MonacoEZcolor/MonacoOPTIX Bundle. All of the Monaco Color Management products are in stock! Calibrate your monitor, scanner and printer....Save time, paper and ink when printing, and make accurate proofs for your clients, lab and service bureaus. You need Color Management today! Fuji has announced the S3 camera, available sometime within the next few months. Fuji has also introduced a line of Inkjet papers which look really nice...We always have your Fuji Pictrography media in stock for immediate shipment.